My husband and I grew up in a small coastal fishing town, and consider fish, especially salmon, to be a regular part of our diet. I admit, it does kill me a little inside to buy fish from the store, when I was so spoiled to have it hand-delivered to me by my deckhand friend fresh off the boat! I don’t know about you all, but even when you really love a food, it can get rather boring when you cook it the same way all.the.time. My go-to salmon recipe is a simple drizzle of oil, salt and pepper, garlic, and lemon on the grill. Last week I was feeling up for something different, and since we had family in town who are fairly strict vegetarians, I thought this would be the perfect way to try out a new recipe! I actually wasn’t planning on writing up a post about it (otherwise I would have written down what I did more to an exact measurement), but everyone raved about it (even the toddler) and I happened to love it too! 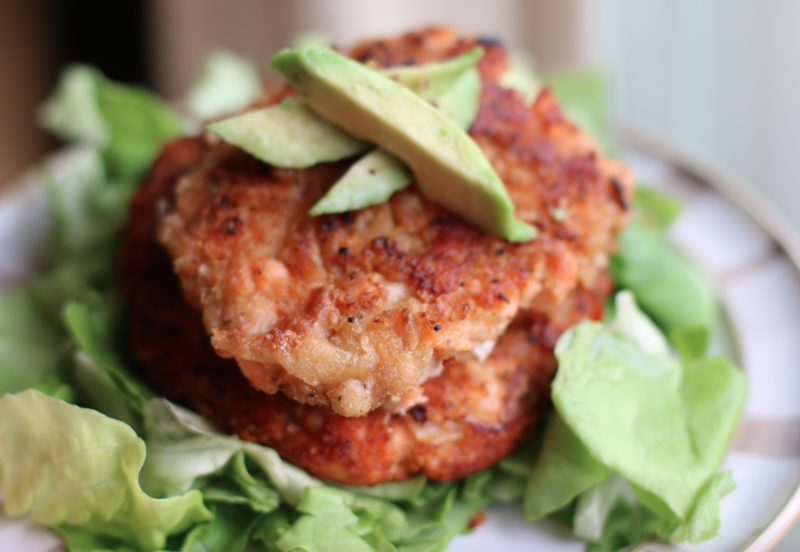 Salmon cakes are fabulous because they are versatile! I served them with salad, avocado, and a baked potato on the side. 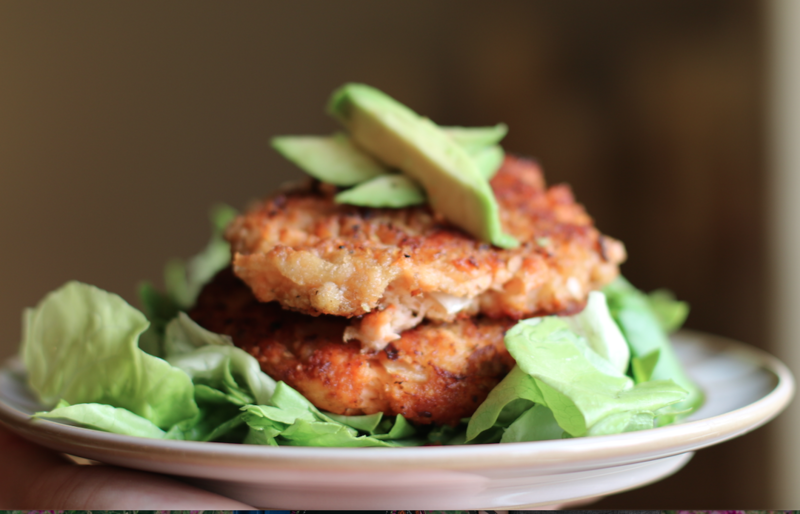 You could easily use these with tarter sauce on a whole-wheat bun, with a zesty marinade, or over a bed of rice. A moist and flavorful way to eat salmon. 3/4 of a whole onion, minced. Prepare salmon filet on baking sheet, drizzle with olive oil, salt and pepper. Bake 15-20 minutes until flakey and pink. While salmon is baking, chop onion and garlic and mince together in food processor (or chop super fine). Toss in large bowl. Add remaining ingredients, sans crispy onion topping, and mix well. Remove salmon from oven to cool. Pulse crispy onion topping in small food processor (or mash in a ziplock bag) and place in shallow bowl. Add chunks of cooked salmon to the bowl mixture and combine well (I wash my hands and mix my hands). 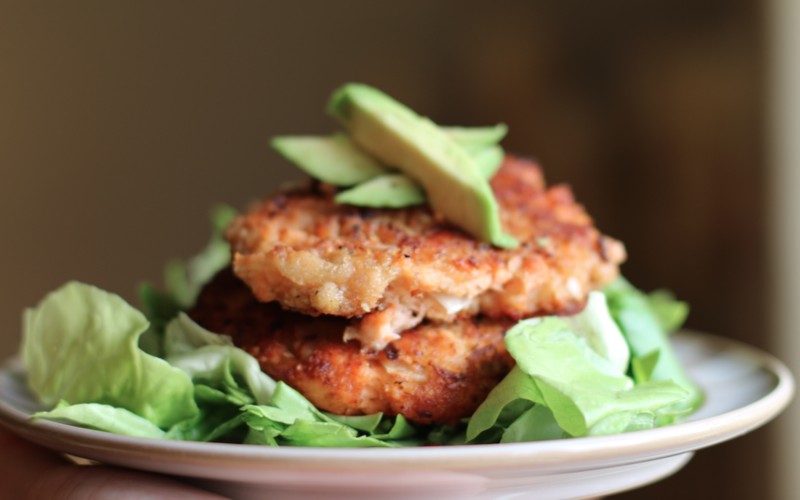 Form into balls, and then into patties (use small plates if you want even and uniform shaped patties). Preheat oil in large skillet pan over low to medium heat, pat each patty into pulverized crispy onion mix and fry lightly about 4 minutes per side. I can’t wait to make these! I really need my husband to catch some Salmon ASAP!